PEP stood for "prize in every package." It was Kellogg's answer to Wheaties, which would have mail in offers printed on the box (which usually required several boxtops along with a nickel or a dime). Some famous American icons use to promote "Kellogg's Pep"
back in the 1920's and from the 1940's to 1950.."Superman"
promoted the cereal on the radio. Sorry. I have no idea, but perhaps another Boomer will step in here...? No. What I am referring to are the original Pep airplanes - printed on thin sheets of wood meant to be cut out and glued together as gliders (in The Day they flew great launched off the second floor back porch). I'd like to be able to duplicate some (or many) of these for my own (nostalgiac) entertainment. Hi, Mild Bill. Do you mean like the balsa gliders in our Toys gallery? Try Googling "balsa wood model plane" and selecting "Images". Where can I find images of the "thin wood sheet" model planes?? My dad's the one who suggested adding Pep to this gallery; he loved it. I tried to get my dad to eat this cereal for the premiums but he wouldn't go for it. When I nagged, he got mad. I was just the opposite. 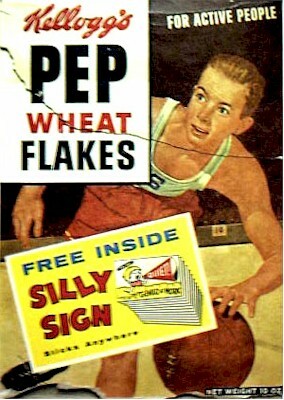 I preferred Pep to Wheaties, though generally I was a corn flakes or rice krispies eater. Back in the 40's they had Superman premiums. I hated PEP, but I loved the premiums they put into their packages during and just after World War Two. During the war, the premiums were model fighter plane parts printed on thin sheets of balsa wood which you could punch out and assemble. And after the War, the prized premium were sets of small metal button pins, each one featuring a comics character. In fact, whenever I could scrape together 23 cents (! ), I'd buy a box, then dump the cereal and the box after extracting the pin.